​​retirement planning and financial services for those at or nearing retirement. The SHP Retirement Road Map® Show is a weekly financial radio show and podcast series dedicated to providing the most up-to-date financial news and information for those at or nearing retirement in a fun, entertaining and easy-to-follow format. who started their financial advisory firm in 2003 with the mission of providing sound retirement planning and wealth management strategies for today's retirees. In their 52 years of combined experience in financial services, Gregoire, Ellis, Peck and the team have identified five distinct areas of risk for retirees, that when addressed properly, lead to confidence and clarity to live the type of retirement you deserve. This means, a retirement that isn't just dependent upon a booming market. It's built to perform in any economy - a written plan for success. Subscribe to The SHP Retirement Road Map® weekly podcast to learn more tips, tricks and strategies and the most up-to-date news regarding each of the five areas of SHP Financial's Road Map® process. 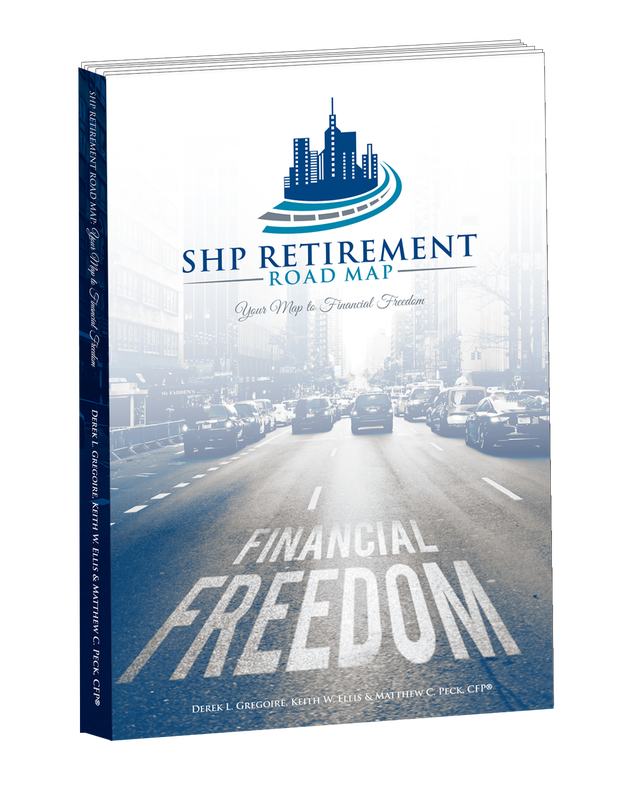 Written by SHP Financial Co-Founders, Derek Gregoire, Keith Ellis and Matthew Peck, CFP, this book provides you with the tools you need to guide yourself to and through retirement. Click here to request your free chapter today! © 2017 SHP Financial. Investment advisory services are offered through SHP Wealth Management LLC., an SEC registered investment advisor. Offices in Woburn, Westborough and Hyannis are offices of convenience and only used for client meetings. *Guarantees provided by insurance products are backed by the claims-paying ability of the issuing carrier. All complimentary white papers, reports and book chapters are provided for informational purposes only. They are not intended to provide tax or legal advice. By requesting these materials you may be provided with information regarding the purchase of insurance and investment products in the future. By contacting us, you may be offered information regarding the purchase of insurance and investment products. "